WILL ANOTHER CONCERNED UBS OFFICER DIVULGE MORE COVERT UBS CLIENT NAMES? Embassyofswitzerland.com reports: “A concerned reliable UBS source has said there are other names available of ultra high net worth political, drug, arms and white slave criminal family children insinuated within Swiss schools by UBS and alike banks. This pandering is done allegedly by UBS to curry favor for the crime family Swiss Bank accounts. Assumed names with one or two proper name letters changed but similar pronunciation to facilitate the child is common. 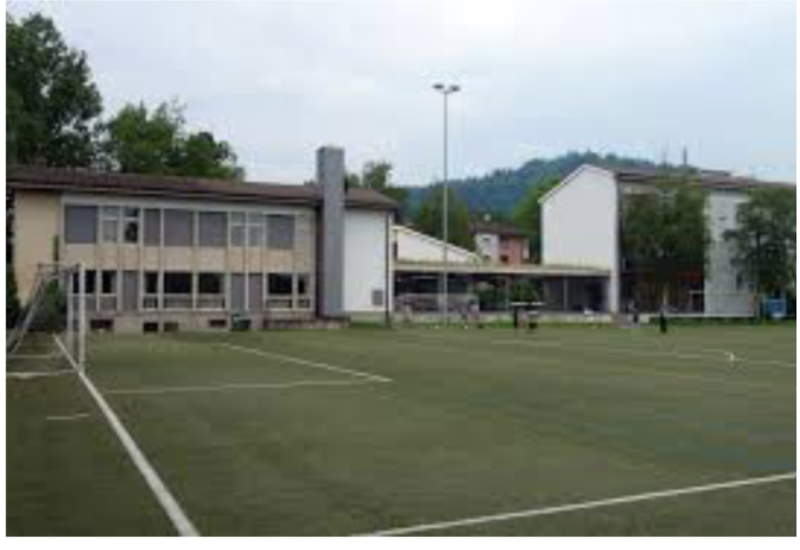 This practice has endangered unsuspecting Swiss and other potential collateral damage children also attending the schools.” N2 Swiss banks are expensive and supposedly make most money hiding criminal and political assets as well as stealing those assets upon perceived weakness. What if there was an explosive incident? What would happen if the clandestine child got angry with another at the school? What would happen if an unknowing teacher or administrator severely chastised an embedded child? 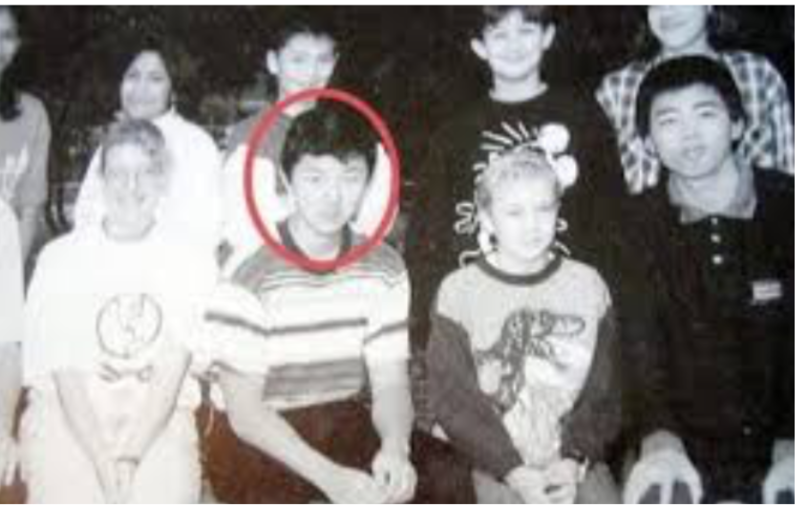 What if Kim Jong-un carried a school grudge soon to be gratified? The Swiss bank perpetrators scenario would provide a media disinformation cover up. Allegedly UBS or alike other would neither confirm nor deny any implication to the best of their recollection. Lastly, there is the timeworn Swiss bank confidentiality. Perhaps the Swiss president would seek out the criminal family and apologize with the usual embarrassing photo opportunity. The sadness comes with knowing this pandering jeopardizes Swiss children to obtain criminal bank account assets, for profit. ARE SWISS FAMILIES CHILDREN JEOPARDIZED FOR UBS GREED? Embassyofswitzerland.com says: “Are Swiss families jeopardized by repeatedly allowing controversial foreign children to be secretly insinuated within Swiss schools? 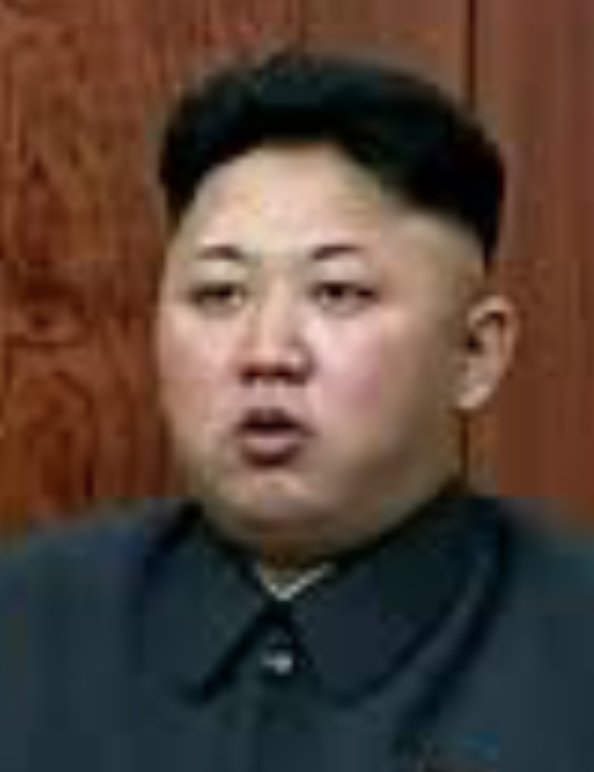 In actuality, the North Korean Supreme Leader has a substantial amount of account assets allegedly in either UBS or a similar perpetrating Swiss Bank. The Bank was instrumental in getting the Supreme Leader’s son into the Swiss school under the assumed name. 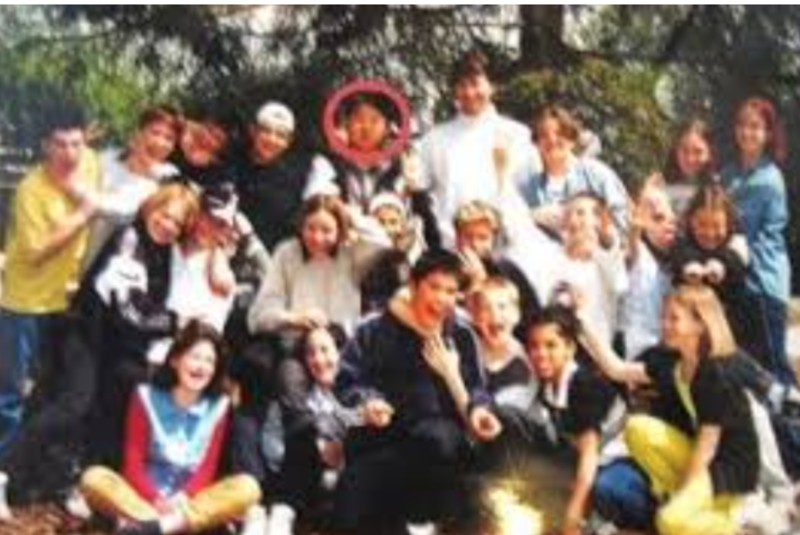 It is believed Kim Jong-un was initially groomed to be the family offshore moneyman, overseeing the Swiss family bank accounts.” N3 The questions yet to be addressed are: How many other children presently are secretly insinuated within Swiss Schools? Should the Swiss voters be told? This Swiss Bank behavior jeopardizing Swiss citizens has been going on quite some time. We reported (Issue 11) UBS allegedly facilitates ultra high net worth client leaders of drug, slavery, arms etc crime families as well as politicians by insinuating at least one of their sons into Swiss schools. The justification for the family offshore accounts is that the family has to be able to fund crime rejuvenation or counterrevolution if destabilized. A reliable UBS source said: UBS officers were put in fear when international criminal oligarchs found UBS betraying both overt and covert US client trust. There has recently been an extreme reluctance of UBS officers to travel outside of Switzerland into oligarch client control zones. A reliable source said UBS has again threatened employees (Issue 6) with at very least immediate termination if they assist clients targeted by UBS. We believe there will be many more continuing suicides and accidents of UBS officers. 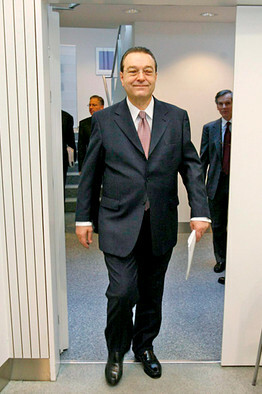 WAS UBS CHAIRMAN RAOUL WEIL AN UNPROSECUTED CRIMINAL GENIOUS? SeniorSavior.com says: “The more we delve into the murkiness of UBS international banking the more we find a duplicitous pattern of overt and covert international banking practices honed over millennia. We keep bumping into fugitive from US Justice UBS Chairman Raoul Weil (United States of America v Raoul Weil Case # 80-60322 US Southern District of Florida) as we discover more UBS criminal intrigue. UBS overtly gives money to Utah symphony and gifts to Utah 3rd District Court (Issues 13 &14), among Utah others. It gives overtly though the Orwellian ‘UBS Americas Fund for Better Government’ PAC (political action committee, Issue 8) to US elected political operatives. The covert will be discussed in later issues as more reliable sources report. To partially pay for these operations UBS takes from UBS perceived weakened high net worth US senior citizens by targeting, soliciting, recruiting, harvesting and then transporting them as client victims to the infamous Utah 3rd District Court processing mill, only to be yet another UBS victim on their Utah profit growth graph (Issue 13). New York Attorney General took action by initiating a continuing class action for more than 400 UBS client victims at a promised 40% return. All of these UBS machinations seem to have UBS Chairman Raoul Weil’s fingerprints (Issue 1,5 & 7). Why was UBS Chairman Raoul Weil allowed US Government personal recognizance even though he was a Swiss citizen and known critical flight risk criminal? Was his escape from United States Justice politically contrived? How is UBS Chairman Raoul Weil able to continue unabatedly managing known US areas of UBS from Switzerland without Washington interference? Why has UBS Chairman Weil’s alleged US criminal infrastructure not been completely dismantled? Why does Washington still allow US Federal agency unregulated UBS AG Utah Industrial Bank to predate upon vulnerable high net worth US senior citizens? Why is UBS AG allowed to misrepresent UBS Utah Industrial Bank in Utah State and Federal District Court documents as a United States Federally regulated UBS Bank USA to the unsuspecting world? How does UBS AG keep UBS Utah Industrial Bank (aka UBS Bank USA) from being criminally prosecuted by US Federal agencies? How are these UBS alleged criminal activities allowed to continue within the United States when UBS has been forced to shut down their criminal aspects in other countries? It was reported several years ago Israeli and US intelligence have access to Swiss bank covert files but story continuance was spiked.” N4 A reliable source has said Raoul Weil finally avoided criminal prosecutions within the USA by using the elaborate Clinton/Bush II/Obama UBS deferred payment scheme. We and approximately 26 other media saw his two Ft Lauderdale prosecutions as a farce. Even the Swiss authorities left for nearby beach swimming. Newsweek reports: “Get government out of the shadows. Corruption thrives not just on plainly illegal bribes, but even more on legal practices such as political donations, lobbying, and the revolving doors that reward lawmakers and regulators with juicy jobs in industry.” N5 Under UBS master criminal Chairman Raoul Weil UBS has set up a criminal system within the United States to facilitate the harvesting of high net worth senior citizens. In many cases it has been outright systemized theft of client account assets. Resource Center reports: “The UBS AG Board refused to investigate the missing trust fund of $250,000 which left a California World War II 80 year old widow bankrupt and her 63 year old Parkinson’s disease victim daughter without medical care. A UBS AG Director flew to Laguna, California from UBS AG headquarters in Zurich to seek sole power of attorney over the trust set up for the two frail senior citizens at UBS AG. It is alleged either the Director or UBS AG pocketed the $250,000 after receiving the power of attorney from the two trusting California seniors. Despite numerous documents substantiating the elderly women’s statements UBS AG has refused to comment or take action on the alleged theft.” N6 It is common knowledge UBS AG has allegedly been stealing account assets of vulnerable clients since at least the Holocaust victims. It is alleged that when UBS perceives weakness or threat it steals client account assets. It is clear the UBS AG Director personally went to California to assess the weakness of the elderly women. Reliable UBS sources say historically UBS has allegedly stolen accounts of clients who are perceived to be incapable of media, judicial or other threatening action. Our awareness of this UBS behavior put high and ultra high net worth UBS clients on notice. SeniorSavior.com: “These names include many of the super rich within the USA. These members have been solicited by UBS. One Director allegedly had her account assets taken by UBS incentivising the UBS stockbroker salesman whose whereabouts UBS will not divulge. This is similar to UBS mortgage manager Mark Boinavich whose whereabouts and Client mortgage documents UBS will not divulge to another Palm Beach elderly victim member. Another Director pulled out of UBS allegedly when UBS started offshore shifting and other onerous behavior, without his knowledge. Ironically, at least one Director is an attorney with prestigious Palm Beach law firm Alley Maass Rogers & Lindsay who UBS has allegedly accused of fraud in Utah 3rd District Court documents.” N7 UBS just does not get it. These people talk to each other and read about UBS criminal dealings herein and elsewhere. UBS is to be avoided at all costs. Why does UBS continue to target and solicit these people knowing SeniorSavior.com is spreading the word? SeniorSavior.com reports: “What started out as a credit line/mortgage hen fight between attorneys of reputable Alley Mass Rogers & Lindsay of Palm Beach and in-house UBS lawyers General Counsel David Aufhauser and associate Craig Darvin (Issue 13), has allegedly turned into a political scandal of international proportions. Amazingly, both parties represented the UBS targeted Florida senior citizen. SeniorSavior.com hopes to have a Civic Association Member or alke in every wealthy community targeted by UBS.” N8 Presently, European Union and Brazilian media are investigating the assertions made within all of the internalrevenue.com issues. SeniorSavior.com reports: “Wealthy US seniors migrate back early November to Florida for proof of citizenship by voting. Being Florida domiciled avoids high taxes of states like New York and Connecticut. This migration starts UBS targeting, soliciting, recruiting and harvesting of these wealthy senior citizens. It is ironic that the Atlantic shore fish migrate at the same time only to get entangled in nets similar to those of UBS, metaphorically speaking. Ultra high net worth SeniorSavior.com members have been targeted and solicited in hopes of recruitment by UBS. 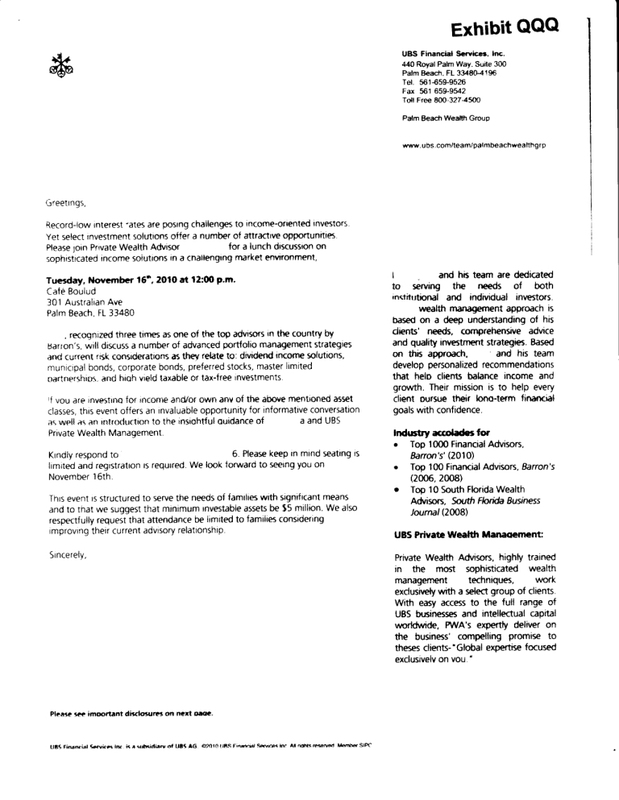 Last year UBS Palm Beach attempted a similar targeted solicitation rendition with four salesmen. Now there is only one left. One of the four moved to the eerie looking UBS Southampton, NY office, taken his children out of private school and put them into local public school, purchased a modest home et al allegedly because of financial difficulties.” N9 Like jackels following zebra migrations, UBS follows wealthy from Northern summer enclaves to Florida. Palm Beach is still considered their foremost target. Recently, UBS and Palm Beach law firm Gunster Yoakley’s controversial lawyer Danny Handley ended creating suspect trusts for controlling the approximately $147,000,000 Robert L and Eunice Gardiner’s estates. Seniorsavior.com covers the Court deliberations of the attempted swindle of the Gannet heir’s estate assets by Hanley/Gunster. It was reported throughout Florida that Gunster law firm almost went bankrupt in a jury settlement in favor of the Gannet heirs. At the very same time we reported Hanley/UBS were allegedly swindling heiress Eunice Gardiner. Due to alleged back room connivances approximately $147,000,000 Gardiner estate is now successfuly controlled by UBS and Dan Hanley as trustees to their created trusts! OSWALD GRUBEL WANTS UBS TO GET RESPECT FROM WEALTHY! SeniorSavior.com reports: “We assisted an elderly lady from Boston who has no debt and no mortgage on her property. She was solicited by UBS who now has some of her assets under UBS control. UBS has been pressing her to turn over her remaining assets to UBS. UBS wants her to take a credit line/mortgage agreement out on her property. She is reluctant to do so because she does not need the money. UBS is allegedly now saying she has the capability of making a lot money by purchasing low valued stocks using UBS loans. This is the same UBS target, solicit, recruit, harvest and Utah 3rd District Court process scheme we have reported (Issues 6 – 13).” N12 How long are UBS alleged scams going to be tolerated within the US wealthy senior citizen community? 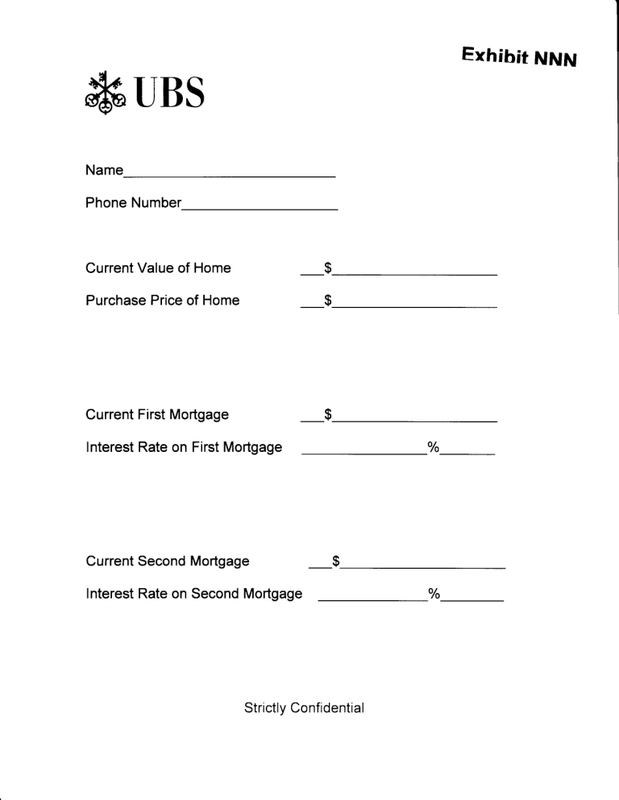 WHY DOES UBS ALLEGEDLY BAIT AND SWITCH USA SENIOR CITIZEN CLIENT MORTGAGES? 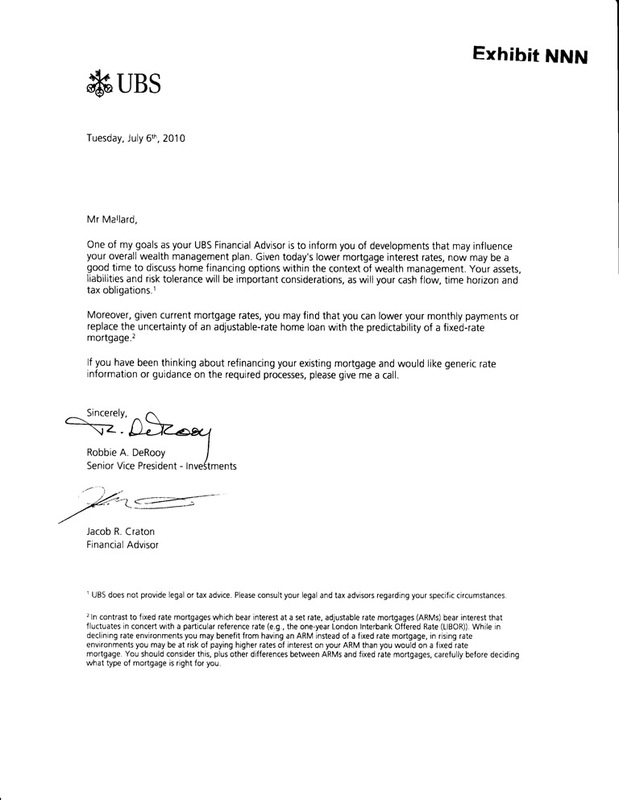 Telegraph.co.uk reports: “John Chatfeild-Roberts at Jupiter (investments) says that this crisis reinforced the message that some assets, notably property, are illiquid assets and that they cannot be offloaded in a hurry when problems emerge.” N13 UBS continues to solicit clients through their alleged mortgage Bait and Switch (Issues 6 – 14), especially in Florida and California. New York Times reports: “ ‘The president’s regulatory reform plan is not about fighting the last crisis, but trying to avoid the next one,’ said Michael S. Barr, assistant Treasury secretary for financial institutions. ‘If we preserve known loopholes in consolidated oversight, then we will just be inviting the next Bear Stearns or A.I.G.’ ” N14 Mr Barr parrots his boss. These statements have been all talk and no action. Let us not forget UBS got a US Treasury AIG counterparty bailout of $5,000,000,000 while on US Justice parole. UBS continues their fraudulent activities unabated within the US by harvesting US senior citizens through unsolicited enticements. Bloomberg reports: “The U.S. Justice Department dismissed a landmark criminal case against UBS AG that prompted the bank to admit it helped Americans evade taxes. Prosecutors said today that Zurich-based UBS, the largest Swiss bank, complied with an 18-month agreement signed in February 2009 to defer prosecution on a charge of conspiring to defraud the U.S. by helping 17,000 Americans hide accounts from the Internal Revenue Service. As part of the agreement, UBS paid $780 million, admitted fostering tax evasion from 2000 to 2007 and handed over account data on more than 250 U.S. clients, piercing the veil of Swiss bank secrecy. UBS later turned over information on 4,450 more accounts. Prosecutors said UBS honored its pledge to end its cross-border business and cooperate with the government.” N15 We do not know if this perplexing decision is political or part of the grand game with sanitizing ultimate UBS sacrifices being made. We had been informed this UBS decision was coming despite our contradictory reporting. The only ripple effect from Switzerland seems to be that US citizens require Swiss visas. UBS international clients should be suspicious. UBS AG ALLEGED MOTTO: BUY HIGH SELL LOW STEAL FROM PERCEIVED VULNERABLE CLIENTS TO MAKE UP DIFFERENCE! Reuters reports: “Brazilian billionaire Andre Esteves is in talks with an investor group from Singapore to sell a stake of about 15 percent of his Banco BTG Pactual SA … Esteves and partners had bought back the bank from UBS AG (UBS.N) for $2.5 billion last year. N17 UBS AG allegedly bought BTG high and sold low after running into criminal charges in Brazil. In essence, UBS AG was kicked out of Brazil, selling BTG back to Esteves and cronies for a low price. UBS AG has allegedly promised the Brazilian Government not to do bad things anymore if they can come back (See Issues 2 & 10). They are buying another Bank from Deuchabank at a high premium. UBS AG continues to buy high and sell low making up the losses by allegedly fleecing USA clients like the Florida senior with dementia. We Googled Judge Sandra Peuler and found she had won a national woman judge award. She is the one who officiated over the case # 080926075 mentioned in your issues and we looked at the case. We asked around Utah and found Judge Peuler a pretty decent person. Did she know the drunk vomiting excreting lawyer mentioned in your issue thirteen? Any layperson can see in many instances case 080926075 doesn’t look procedurally proper. This is depressing to law students and first entry Utah attorneys. Young women law students look for guidance from those like Judge Peuler. It is demoralizing. Can you write more about this action? We will spread the word and be in contact. Queries by our readership: Lawyer Levitt is no relation to former Utah Governor Leavitt. Anthony Borrelli is no relation to alleged Borelli of an alleged New Jersey Mafia crime family. We are amassing a large quantity intelligence regarding UBS machinations in various venues, especially Utah. We are arranging our compilations so as to keep our readership interest. Some of the concerned media are becoming irritated with our slow pace but we sacrifice expediency for thoroughness. Bare with us, please. We truly thank those who are giving us information displayed within our issues. Without their assistance and heads-up we would not have the ability to convey this information to our readership. Some are divulging under the threat of physical harm. We have already reported sundry UBS related suicides and accidents. We have already seen a US Congressional Committee investigating UBS grant demanded witness protection offered only to Mafia informants. We now know considerable about perpetuating Utah Industrial Banks, penny stock and other Utah swindles heretofore censured. The Utah Industrial Banks and their accompanying Utah support bureaucracy are by far the largest known swindlers within the United States. We have been told this endemic criminal activity has been rampant for decades with token Utah or Washington prosecution. This could be why the likes of fugitive from United States Justice UBS Chairman Raoul Weil (See Issues 7 & 10), as well as other UBS associates, chose Utah Industrial Banks. We already see international media perusing the matter at this juncture, partially exposed by the nefarious UBS treatment of a stalwart Florida senior citizen with clinical dementia (Exhibit G). We feel very sad at the treatment given the Florida senior citizens fleeced of all their assets by UBS and their accompanying lawyers. They are just one of 70,000 predominantly out-of-state client victims dubiously processed within the Utah 3rd District Court by Utah Industrial Banks, unregulated by any United States Federal banking agency. We do know that seniorsavior.com and others are banding together to keep the enumerated Florida senior citizen cause alive and make him a martyr for other seniors fighting the likes of UBS. UBS will invariably attempt to intimidate the United States 2nd District Court in Southern Florida as US fugitive UBS Chairman Weil (See Issues 1 & 8) successfully did before his necessary escape. UBS Chairman Weil is literally the man who knows too much about Utah and Washington. Again, this is a continuing United States breach of national, if not international security.